Since the National Council of Peace and Order (NCPO) has taken control of the Thai administration, criticism of its handling of the economy has been widespread. While critics have focused on the junta’s lack of expertise and the short-term outcomes of its economic policies, there has been little attention on its distinctive strategies. This paper focuses on the conjuncture in Thailand’s political economy, which provides a unique context in which the junta is conditioned to respond. Based on its conviction that various types of workforce each have their own place in society, the junta has responded to the policy recommendations of state agencies, technocrats as well as business interests with predictable but highly contentious results. A month after the May 22, 2014 military coup, coup leader General Prayuth Chan-o-cha presented his general reform plan, the so-called Road Map, during one of his regular Friday speeches. He stated clearly that “security must be integrated with all dimensions [of the reform]; economic, social, psychological.” According to him, security is imperative at that critical moment, since it fosters order, the most needed element within Thai contemporary society. 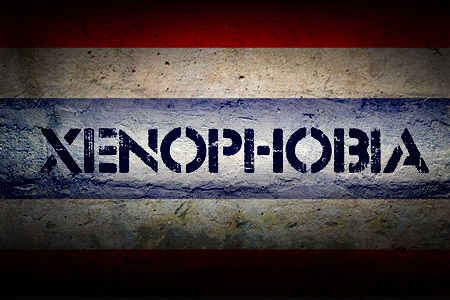 The junta’s over-zealousness for the control of foreign migrants may be symptomatic of its own hyper-xenophobia, as Charlie Thame has noted in New Mandala. 1 As Thame observes, General Prayuth’s own dissertation research at Thailand’s National Defense College in 2008 identified ‘migrant workers and undocumented persons as one of four urgent threats to Thai society. While the National Council of Peace and Order (NCPO) appears to make sense of all national issues through the lens of security alone, this paper will argue that the urge to manage and control the foreign migrant workforce should be understood in conjunction with broader issues of wages and employment in Thai political economy. By focusing on specific contexts – the conjuncture at which the NCPO came into the Thai political landscape—this paper will foreground the Thai junta’s broader motive to facilitate processes of economic development which have been disrupted by political and social upheaval. It will argue that we will better understand the role of the NCPO and its strategies, as a coordinator of state agencies and business interests. While the issues of human trafficking and foreign migrants are deeply connected, the NCPO’s responses to human trafficking are not discussed here. This paper focuses instead on the ways in which the handling of foreign migrant workers, the national minimum wage determination and unemployment issues altogether become a crucial conjuncture for the NCPO in its crafting of policy responses – ones with the overarching strategy of containing the workforce. It is crucial to note that many of the NCPO’s policies are not unique; some of their proposed solutions have been circulated within society for some time. However, such the conjuncture provides a unique context in which the junta is conditioned to respond. With the main conviction that several types of workforce each have their own place in society, the junta has responded to the policy recommendations of state agencies with predictable but highly contentious results. Over the past year, the Thai economy has simultaneously experienced a dilemma of a claimed shortage of labor in certain sectors, on the one hand, and growing unemployment, particularly for university graduates in the urban areas, 4 on the other. For many, this rising urban unemployment is a sign of recession, partially as a result of internal political upheaval. 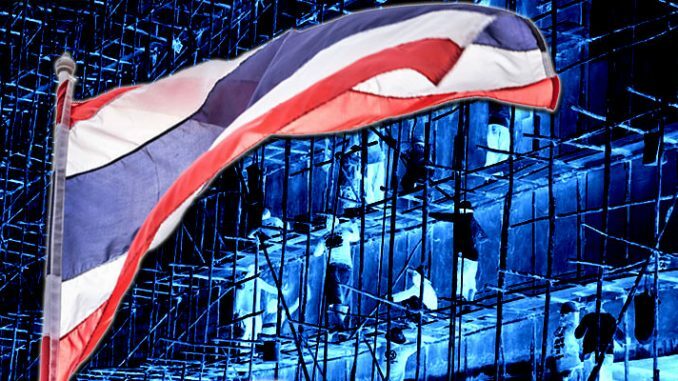 In the long term, businesses are anticipating a shortage of Thai semi-skilled and skilled labor, particularly in the retailing, service, construction and automobile industries. The current shortage of workers is instead ‘a shock’ – from the business point of view – an unexpected shift in workers’ willingness to receive lower wages than a new minimum wage rate. This is believed to be a result of the Yingluck administration’s policy that raised the daily wage rate nationally to 300 baht in the beginning of 2013. In fact, the minimum wage raise in 2013 has had spillover impacts on wages of foreign migrants across the country as well. 5 On the side of manufacturers, small and medium industries, mostly labor-intensive, such as textiles, clothing, leather, and handicrafts have claimed to be harshly impacted by the enforcement of such a single minimum wage rate. According to the Thailand Development Research Institute (TDRI), one strategic response to the new minimum wage rate has been the relocation of production to border-based SEZs (or even inside Cambodia). 6 However, this corporate strategy necessitates that foreign migrant workers are fixed along the borders. The economic explanation is that containing workers within SEZs allows investors to control costs—and perhaps wages—within the specially regulated production zones. Given the concerns over Thailand’s human trafficking record (as well as the junta’s conservative attitude), the Thai state is able to justify the containment of the foreign migrant workforce. After the coup, the NCPO prepared a ministerial agenda for the Ministry of Labor, in which one priority has been “to promote employment in rural and border areas, in order to prevent undocumented foreign workers from coming to work in the nation’s inner zones.” According to the NCPO, “This is the best solution to reduce congestion for the urban population. Employment promotion strategies may include career-training program in rural areas, special projects in border-based Special Economic Zones such as a legal arrangement for daily commuting foreign migrants etc. (emphasis added). 9 ” While it is not the rural and border areas that are in need of employment, the NCPO presumes that promoting employment there will lead to opening up more jobs (that were taken) in urban areas. Although this causality is weak, concerns over issues of human trafficking, unemployment among Thais, and losing business competitiveness provide a strong legitimacy for the policy. In the meantime, the Thai state is encouraging a new form of daily and seasonal migration around its borders. Most recently, there have been media reports that farm owners in border provinces, such as the eastern provinces of Chantaburi and Trat, are already expressing their desire to hire foreign workers on a seasonal and daily basis. In a sense, containing the foreign migrant workers at the borders will somewhat satisfy the junta who believes that the foreign migrant is in itself a social and security problem. While current policies may or may not prevent foreign migrants from coming into the nation’s inner cities such as Bangkok, as the junta desires, by containing them, technocrats hope to solve the problem of rising wages, and the shortage of cheap unskilled workers, at the same time. 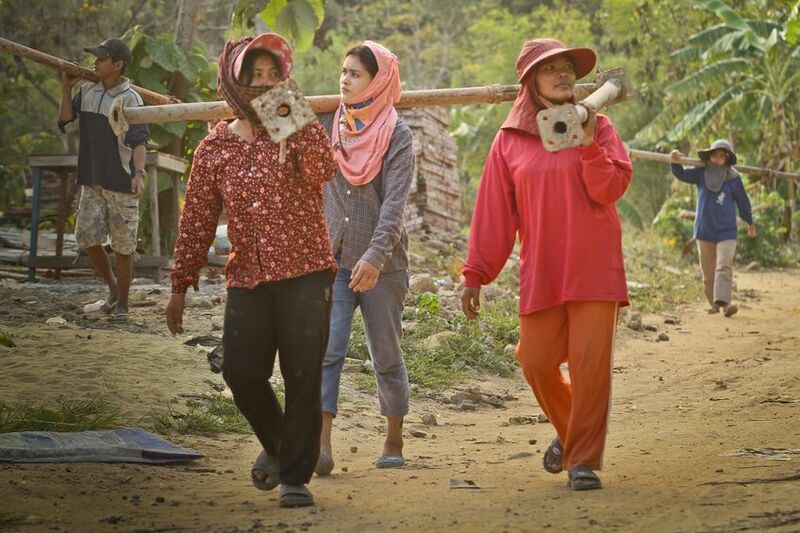 TRAT/THAILAND – Migrant workers from Cambodia, working on the construction of nearby tourist facilities. At an alarming rate, NCPO has picked up a series of controversial development projects suspended in recent years such as the Pak Bara deep-seaport in the Southern province of Satun, gold mine concessions in the Northeast, and the contentious Western Seaboard Industrial Zones. Most of these plans have been strongly resisted by Thai civil society groups. By the same token, the NCPO continues to contain the Thai workforce, politically and economically, mainly by means of disciplinary wages and repressive laws. It is worth noting that the increase of the minimum wage on a national scale since 2013 was a hard fought victory of the Thai labor movement’s involvement within a democratic process, in which electoral politics played a significant role. 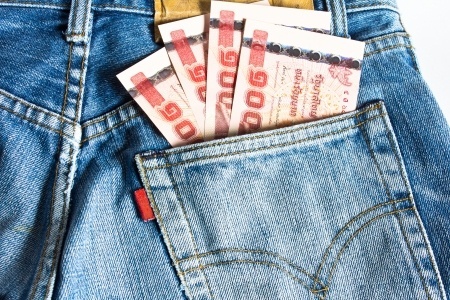 The national minimum wage campaign pushed forward by Pheu Thai was at the center stage of political struggle during the 2011 election campaign and for the years since they took power. During this period, the Thai labor movement had gained much leverage through a process by which they could negotiate openly about how much they would get paid. However, the May 2014 coup once again marginalized the Thai working class in two ways; the NCPO closed down political space, first by means of martial law, which separated collective rights from individual rights, and then by de-politicizing the minimum wage determination process. What under the Yingluck administration had been determined by labor politics has now been shifted back to the hands of a tripartite committee, which is a primarily bureaucratic apparatus. 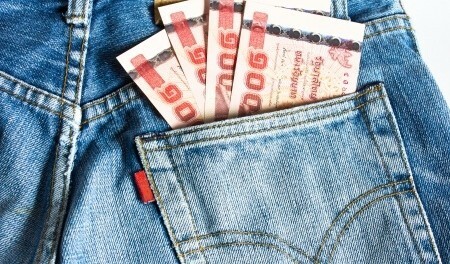 This committee has recently announced the plan to consider a new scheme of wage differentials. 11 Five options are being considered: previously used provincial rates, floating rates, regional development targets, industrial wages, and mixed rates. In short, in the post-coup period, workers can no longer demand better wages in public space, but only though a workplace-based collective bargaining process to which only a handful have access. By denying organized labor its political agency, the junta is now socially marginalizing and politically disempowering workers. Lastly, we need also to recognize the junta’s dual strategy of disciplining Thai working class with coercion, on the one hand, and disciplining the urban-based, educated middle-class through persuasion (in other words, high wages and social benefits), on the other. The latter includes civil servants who have recently received a four percent pay raise. This short paper tries to make sense of why and how the NCPO disciplines two main sectors of the workforce in the Thai economy. 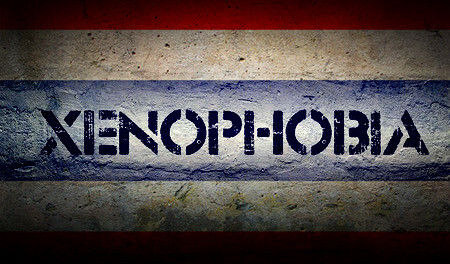 While the conjuncture of several problems provide a unique context, the junta disciplines the workforce by containing it; by geographically containing foreign migrant workers and socially and politically containing Thai workers, the junta has managed to marginalize foreign migrants and dis-empower the Thai working class. Regardless of its expertise, the NCPO plays an important role in coordinating the agenda of both state agencies and businesses – a role crucial to the restoration of political and economic orders conducive to development hegemony. Within a year after the May 2014 coup, the NCPO has made progress in pushing forward projects such as SBEZs and giving a go-ahead to several contentious development projects. Bureaucrats, technocrats and businesses may see this step forward as a positive change—as reform in its own right—because no democratically elected governments would have dared to push such ambitious and contentious plans. However, this forced reform is likely to cause much more tension and resistance from civil society that will in turn reorganize social forces including the Thai labor movement. Kriangsak Teerakowitkajorn is currently a PhD student in Geography at Syracuse University. His current research on labor organizing in Thailand’s industrial estates follows years of research as a lecturer at Thammasat University. Kriangsak has published two e-books in Thai: New World, New Capitalism? (2011) and Capitalism without Heart (2014) and regularly contributes to the journal Fah Diew Kan (Same Sky). Excellent paper Kriangsak, and thanks for the nod :). Although beyond the scope of this piece, you may wish to consider the broader historical and geographical (i.e., sub-regional) context of these strategies. I take a stab at this in the paper linked below, where I argue Thailand finds itself in a structural crisis as a result of its twin reliance upon state practices that suppress wage inflation through the oppression and disenfranchisement of workers from neighbouring countries, especially Myanmar, coupled with its reliance on exports to global markets. Trafficking and bonded labour are a symptom of this crisis. SBEZs and industrial zones in SE Burma under the ACMECS scheme are in part strategies to resolve it, as they will facilitate the extension of global value chains and the outsourcing of labour intensive industries. Thailand will attempt to capture higher value added stages in the production chain, but how successful it is in this regard remains to be seen given the domestic context, as well as their implications for Thai labour.